Rare earth element ETFs are making headway in the investment game, and Absolute Wealth is helping with a Special Report. Rare earth element ETFs are just beginning to emerge as potential bread winners, and the market is turning towards a rise due to strong demand and high price. Today’s AbsoluteWealth.com article said that could mean major profits for both the developed companies and their ETF holders. The bubble has yet to pop, and the time to learn more about the companies, extraction process, and rare earth elements themselves is now, said the article. 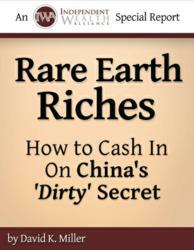 Absolute Wealth has addressed the need for information and investment advice by publishing the Special Report “Rare Earth Riches: How to Cash In On China’s ‘Dirty’ Secret.” It was developed using experts in areas like foreign commodities and consumer demand, and presented as a go-to guide for learning as much as possible about rare earths. China, who has dominated the rare earth production game for a long stretch, decided it would be smart to limit exports. The article said it was to assure companies within its own borders would have access to the abundance of rare earths churned out of Chinese mines. Whether or not that is the true reason, and even if China has ulterior motives, the rest of the world saw an increase in price and a drop in supply. That has caused a global race to be the next big rare earth producer, and companies from the U.S. to Brazil to Japan are hurrying to get into the mix, said the article. That’s why investing in rare earths and the companies that are implementing production procedures to get at them are creating so much opportunity. The article said it’s like the Oil Embargo, only this time it’s rare earths, not barrels of the crude stuff. Unlike gold or silver, rare earth elements, or REEs, are less valuable in raw form. Gold bullion is worth a lot, but the value of rare earths is in their uses, which range from products like cell phones, satellites, and missile guidance systems. Though they aren’t exactly rare (though the name clearly implies scarcity), it’s the extraction and production process that makes them hard to come by, said the article. The companies in best position for profits and increased production are described in “Rare Earth Riches,” as is the proper way to approach investing in rare earth companies. Though the market is never a guarantee, the article said Absolute Wealth’s Special Report makes its case for the likeliest of scenarios in which rare earth element ETFs hold the potential for rising, rising again, and then rising some more.